Easily one of the most revered products in Spyderco's history, the USA-made Paramilitary 2 is the second generation of this immensely popular folding knife. This special edition is even more desirable, featuring Peel-Ply carbon fiber handles and 52100 steel, a forged steel that is only now making its way into the world of modern folding knives. 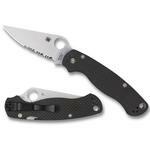 Now available on the Paramilitary 2, this 52100 steel provides exceptional wear resistance and edge holding capability. Heavily used for ball bearings, 52100 needs to be forged into shape, and as such was traditionally used only by blacksmiths. 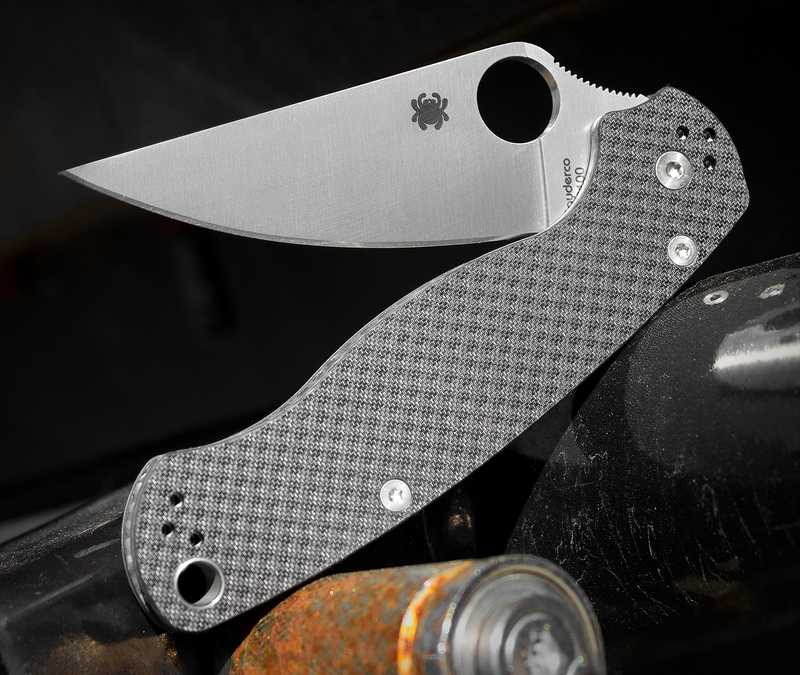 Now available as flat stock, allowing factory production methods, Spyderco has equipped the Paramilitary 2 with this high performing carbon steel. 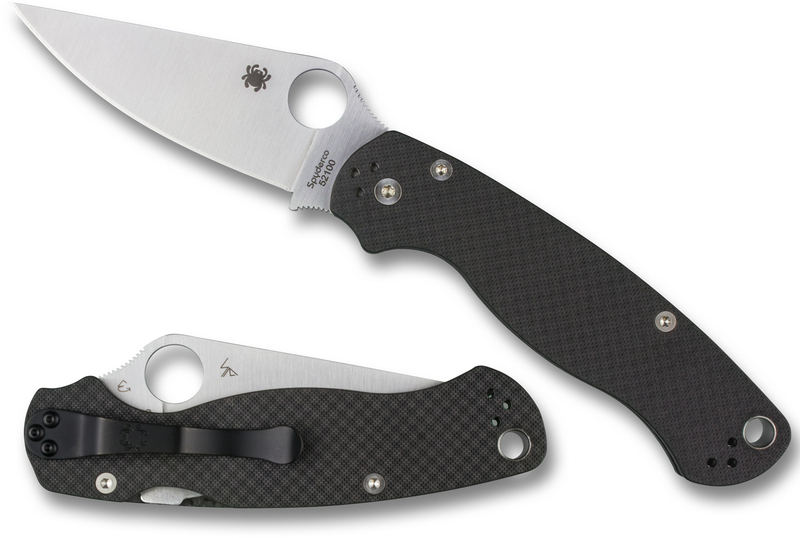 To showcase this rockstar of a blade, Spyderco equipped the handle with Peel-Ply carbon fiber scales. This premium material has a much different look than traditional carbon fiber and is textured to offer incredible amounts of grip. All of these premium features rest on the popular Paramilitary platform. Open-backed construction makes it easy to keep the knife clean and allows access to Spyderco's patented Compression Lock mechanism. Not only is this lock exceptionally strong, it also allows for easy and safe one-handed closing by keeping your hands out of the way of the sharpened edge. 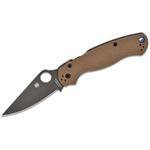 This Paramilitary 2's plain edge blade is easily opened with Spyderco's Trademark Round Hole. This knife is an exceptional slicer thanks to its full flat grind, preferred by many for its cutting efficiency. 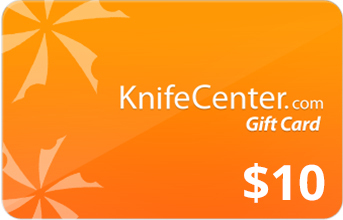 Thanks to the integrated finger choil that extends usable handle length, another common Spyderco design element, the user can choke up on the blade for fine control and really take advantage of the acute point. 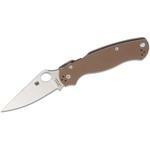 A four-position clip, allowing for a multitude of carry options completes this Limited Edition Spyderco Paramilitary 2. Made in Golden, Colorado, USA. 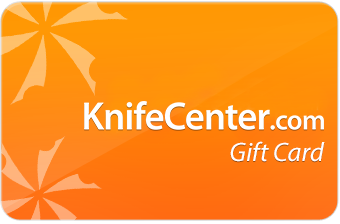 Hey, I wanted to share "Spyderco Limited Edition Paramilitary 2 Folding Knife 3-7/16 inch 52100 Plain Blade, Peel-Ply Carbon Fiber Handles" with you from KnifeCenter.